The Fun Run has been the hallmark of the National Sports Day since it first edition. The Fun Run features a 2.5-kilometre course around Khalifa International Stadium and is a popular activity for families with children and mobility-challenged participants. The start line is between Torch hotel and Khalifa International Stadium. Participants can register from 6:30 am to 7:30 am and the race is set to begin at 8:00 am. An array of unique and exciting outdoor activities will be available for the public from 8:00 am to 3:00 pm which will include Thai boxing, Taekwondo, Boxing classes, High/Low intensity training sessions & Fitness classes for children and adults, Moroccan Sports Corner, Russian martial arts (Sambo), Japanese Kendo demonstration. 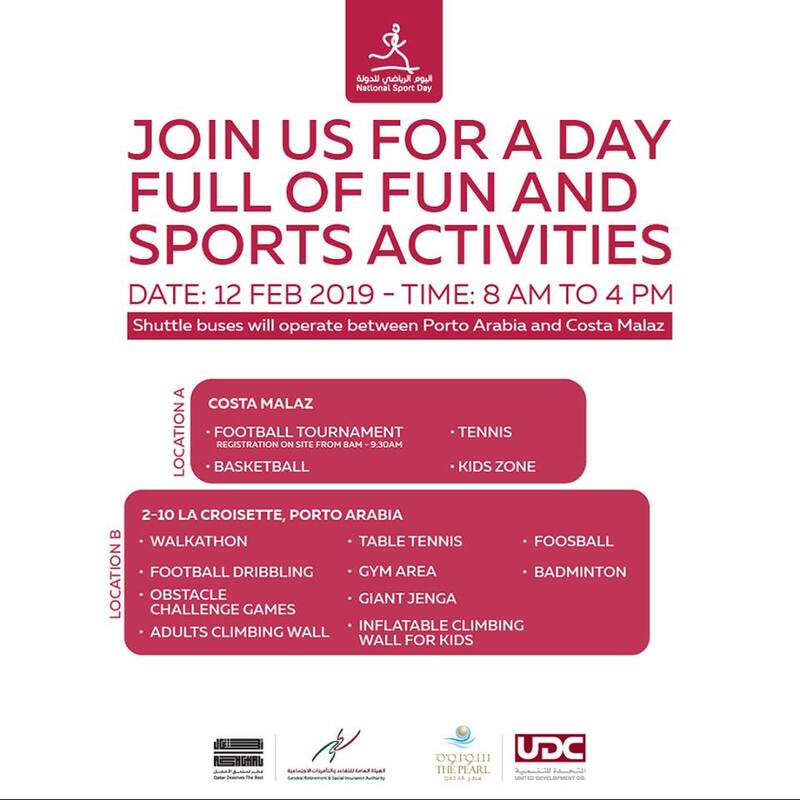 From 10:30 am to 1:00 pm, Aspire Dome will be hosting a number of sports activities like badminton, fencing, agility & obstacle courses and basketball and aerobic classes, with some sessions exclusively for ladies. Take part in the form of fitness walking called Nordic Walking at 11:00 am at the entrance of Aspetar west expansion. The two-hour walk will be supervised by a certified Nordic walk instructor. ‘Total body workout’ version of the walk will feature specially designed poles that will be used for walking. The activity is especially designed to benefit the elderly and people with knee problems. For the first time ever in Education City, a 3km obstacle course will span the length of Oxygen Park and put your speed, agility, stamina, and determination to the test. The obstacle course will comprise 14 challenging obstacles for players to maximize in shortest time possible. You can compete either as an individual or as part of a three-membered team. All participants will be timed-fastest one across wins! Participants should be 18 years and above. This is a smaller-scale track tailored for children to enjoy. Will you be able to overcome all the obstacles? Are you fast and strong enough? Compete with your friends and rush through the obstacles as quickly as you can. First one to cross the finish line is the winner! Participants should be 3 years and above. In collaboration with Qatar Cyclists, QF is organizing a cycling marathon that will put your perseverance to the ultimate test! Cyclists will take off at 10 am from Ceremonial Court in Education City, and will ride to the Museum of Islamic Art. There, riders will take a 15-minute break before returning to Education City. The total distance covered will be approximately 20km, with a cycling speed of approximately 20km/h. Losail Circuit Sports Club will host a ladies only event to celebrate Qatar National Sports Day. Starting from 9 am until 7 pm, ladies can enjoy a wide range of activities. 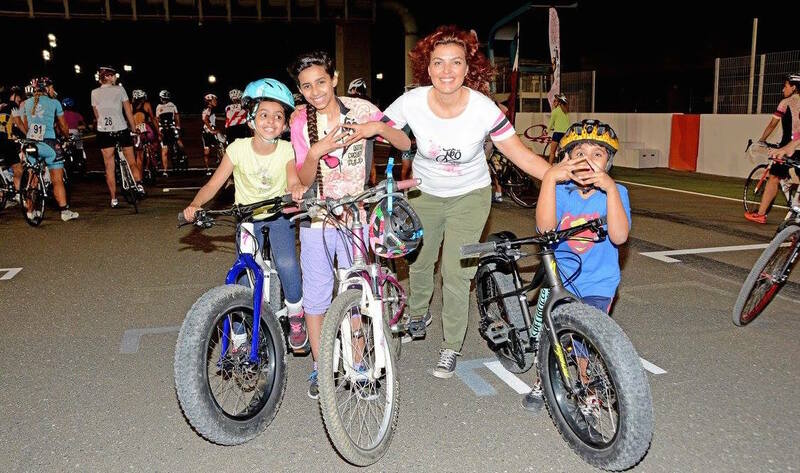 Activities includes cycling, fitness classes, sport activities, healthy lifestyle workshops, activities for children (only boys below the age of 9 will be granted entry). 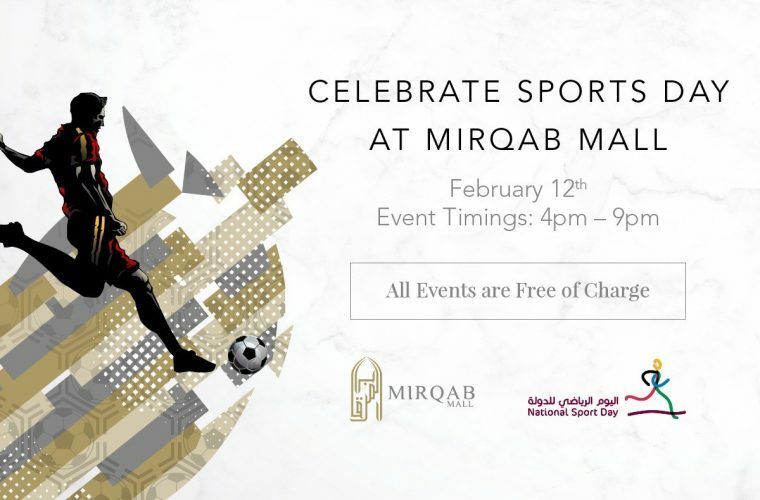 Mirqab Mall will host an action-packed day of activities for the whole family. 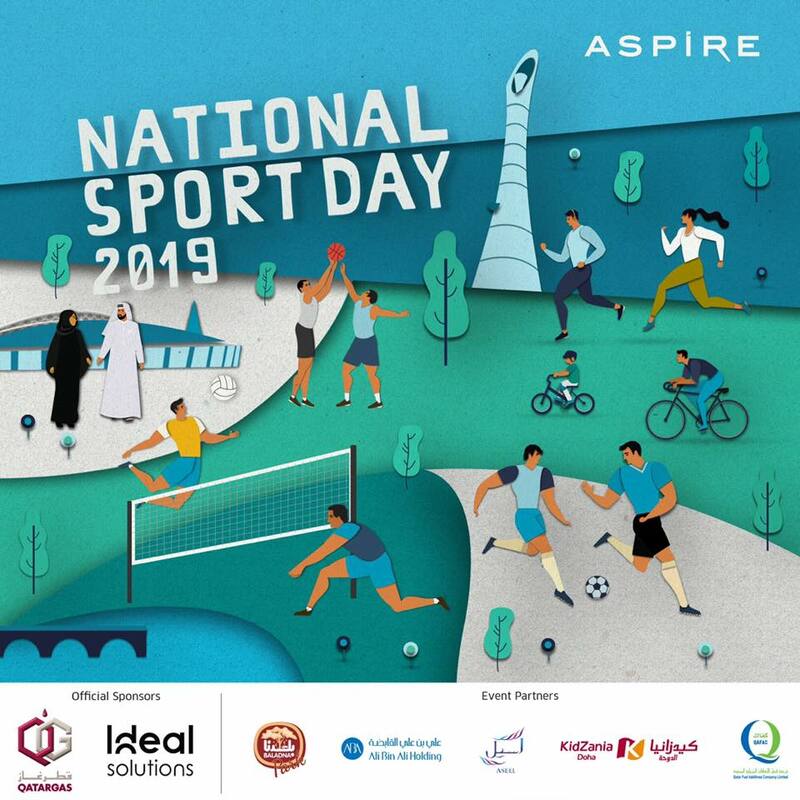 National Sports Day activities at Mirqab Mall will take place from 4 pm till 9 pm. Test your football skills and prove your accuracy by shooting goals. If your skills are judged to be worthy, you will have a chance to win prizes from Mirqab Mall! Participants should be aged 12 years and above. Stretch your body and dance to the beats! This dance routine that doubles as a workout will be thoroughly enjoyable as much as it will benefiting to your body. Join Mirqab Mall on the mezzanine floor at 7:30 pm for a free Zumba class. This interactive walk will course through the ground floor of the mall from 6 pm to 9 pm with delightful surprises and prizes along the excursion. Register now at the Mirqab Mall Customer Service desk on the ground floor. Participants should be aged 12 years and above. Head to the luxurious Grand Sheraton Doha Resort & Convention Hotel to celebrate Qatar National Sports day. Admission to these events is free of charge, with activities like beach volleyball (at the resort garden), rowing challenges (at the Fitness Center) and table tennis (at the indoor tennis court) open all day. The day will begin with meditation and yoga from 7:00 am till 8:00 am in Activity Room 3. For those in the mood for a rigorous wake-me-up, boot camp will take place from 8:00 am to 9:00 am at the Resort Garden. Break a sweat while having fun for 90 minutes with the “Dance till you drop” workout for free from 9:30 AM – 11:00 AM. The Zumba special will be led by a professional team of Imad, Iman, Rachel, Pamela and Carla next to Sheraton’s iconic swimming pool. To really get the sweat running, Sheraton’s fitness trainer, Katherine, will be leading a spinning class in the outdoor tennis court from 9:00 am to 10:00 am. You can also join Sheraton trainer Tarek from 10:00 am to 11:00 am in the same space. For those that need a wind down, Ladies’ Yoga will be hosted in Activity Room 3 from 10:00 am to 11:00 am, and a mixed yoga session will be held there from 4:00 pm till 5:00 pm. There will also be a Les Mills Body Pump activity held at the outdoor tennis court between 6:00 and 7:00 pm. Sheraton Grand Doha Resort & Convention Hotel is also hosting activities for kids; mini basketball, crazy ringo, football, drawing, coloring and face painting. For more information, call at 44854600. Join in for a fun filled day at The Pearl Qatar from 8 am to 4 pm. The sports activities will be taking place in two locations. Walkathon, football dribbling, obstacle challenge games, adults climbing wall, table tennis, giant Jenga, inflatable climbing wall for kids, foosball and badminton. Shuttle buses will operate between Porto Arabia and Costa Malaz. Qatar University is all set to celebrate National Sports Day with plenty of exciting and fun sports activities. First 200 attendees will receive free membership to the gym, swimming pool or women’s sports facilities. 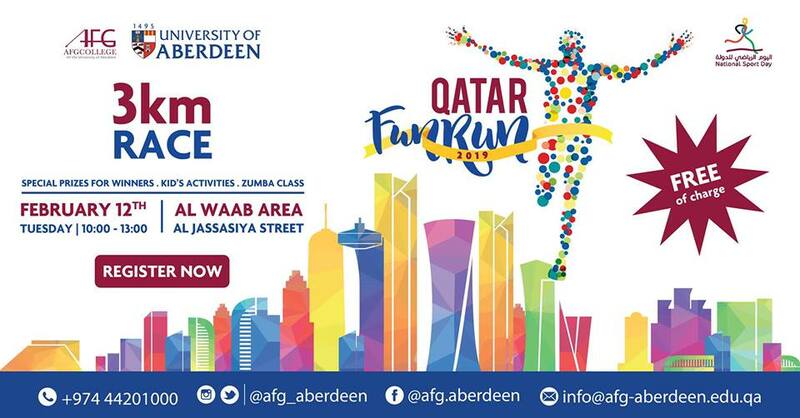 Enjoy the Sports Day by participating in the Fun Run from 10:00 am to 13:00 pm with AFG College with the University of Aberdeen. 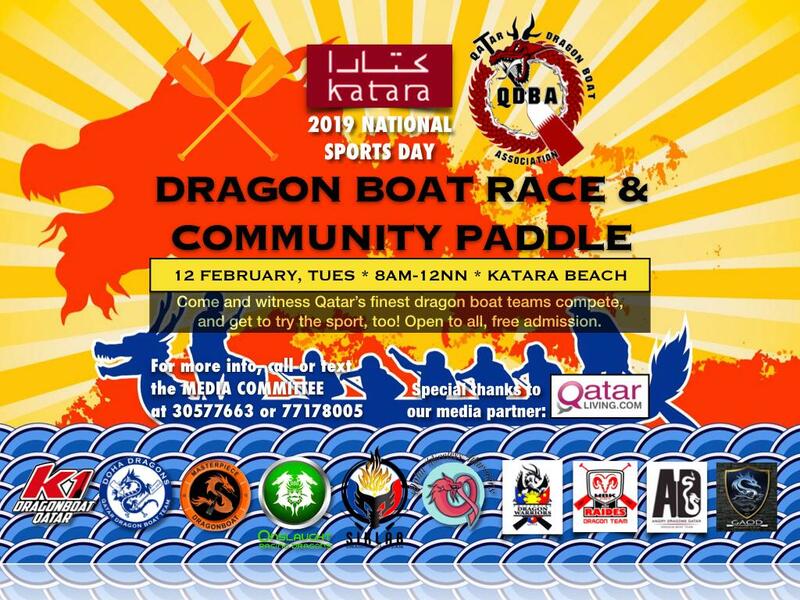 Experience the culture of dragon boat racing and participate in the ultimate team sport at 8:00 am in Katara Beach. Hamad Medical Corporation (HMC) is hosting an array of activities, including free body mass index (BMI) testing, blood sugar, blood pressure, and other health checks, will be available, with nurses and dietitians from HMC on hand to answer questions at Katara Cultural Village from 8:00 am to 6:00 pm. The goal is to emphasize the significance of sport in building a healthy community, while also raising awareness about the many benefits of physical activity and inspiring everyone to adopt a healthy lifestyle. 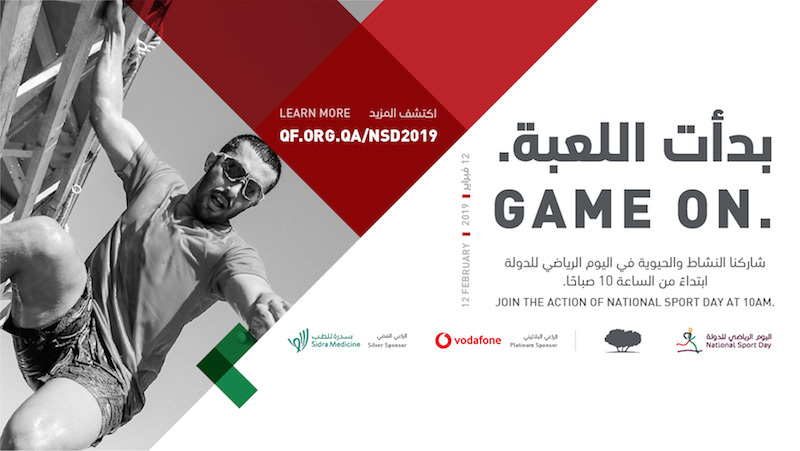 Representatives from the Kulluna for Health and Safety campaign, Ambulance Service, National Diabetes Center, Tobacco Cessation Center, and Blood Donation Unit will also be present on site, raising awareness about the benefits of an active and healthy lifestyle. 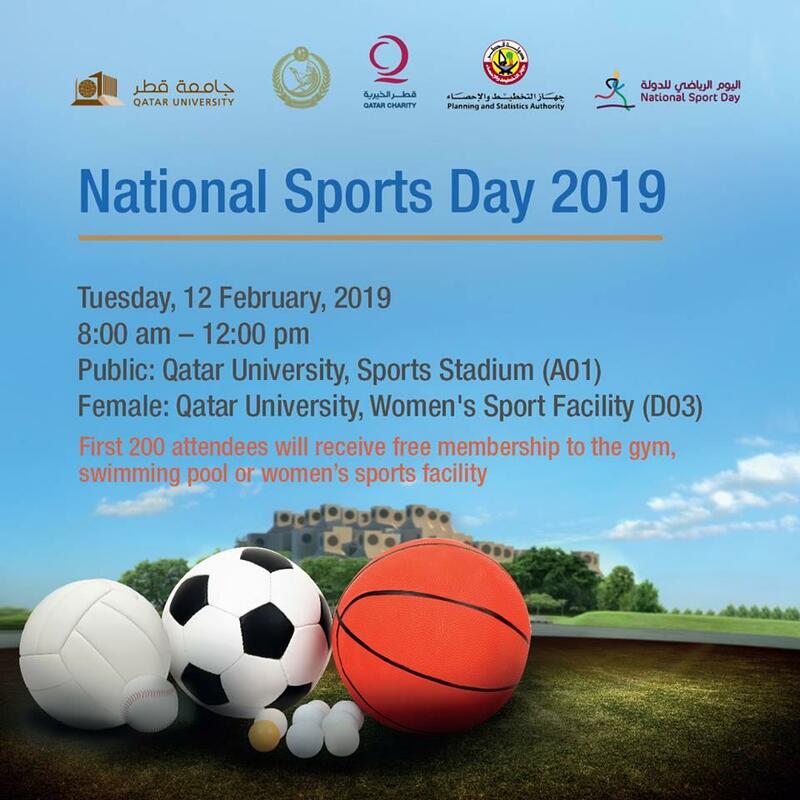 Tomorrow OFF in Qatar Amiri Diwan reported that on the occasion of the Sports Day of the State, which is set apart on the second Tuesday of February consistently, February 12, 2019 will be an official holiday in the state.